Designed for macro shootings, it can render more balanced and smooth lighting due to its ring shape, and help you get rid of annoying shadows in your close-up photos. 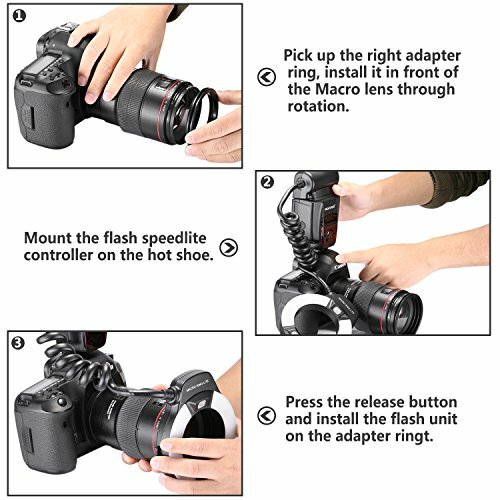 This ring flash light is compatible with many brands of DSLR cameras, hence you don't have to worry about changing dedicated ring flash light for each different camera. For more subtle lighting, you can press the release button to rotate ring flash, then release the button to fix it. It's suitable for macro shooting, medical photography, small to medium size product photography etc. Focusing lamp coverage: Approx 40 degree top and bottom and 45 degree left and rights/On time:Approx.20sec. Adapter rings diameter: 40.5/52/55/58/62/67/72/77mmAdditional Function: Power Saving Mode, Low-Battery Notice,Memory functionCompatible with these cameras: Canon,Nikon,Pentax,Olympus,Samsung; You need to additionally buy a hot shoe adapter for Sony. Additional functions:Power Saving Mode, Low-Battery Notice and Memory function. Choose between two tubes light or single tube light to give you various choices in shooting photos. Adjustable flash ratio control 1:8~1:1~8:1 in 1/2-stop increments, perfect for your desired lighting effect. You can mount the flash light at different angle to make different lighting! Equipped with AF Assist Lamp to aid focus when you're in places with dim light. Has an LCD screen to simplify your control and enhance your efficiency!